The lily has such a shining reputation in the gardening world that other flowers tend to borrow its name to boost their standing. However, neither the calla lily nor the day lily are true lilies. Only those plants in the Lilium genus may rightly call themselves lilies. By planting a variety of lily types, you can achieve a parade of elegant lily blooms from spring until fall for fragrance and cutting. Today's gardeners are spoiled by the vast number of lilies with upward-facing flowers, but that was not a given in the 1970s. 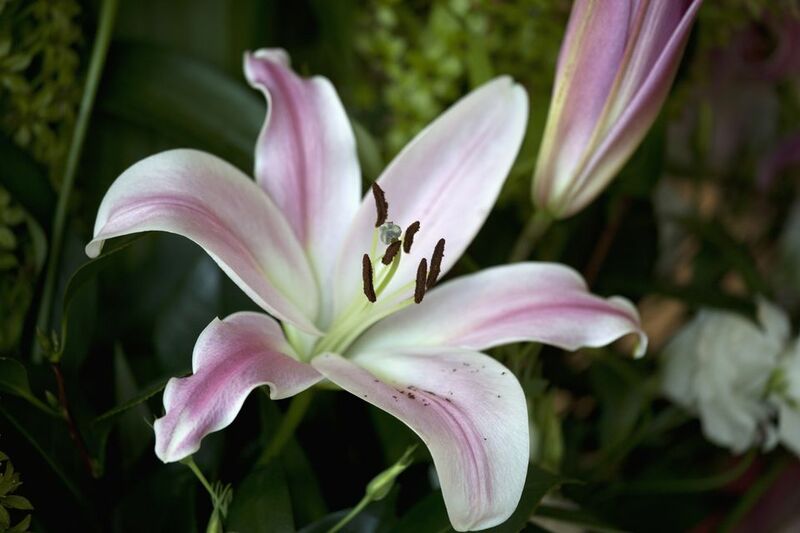 When breeder Leslie Woodriff developed the first Oriental lily to feature flowers that faced the heavens, the Stargazer cultivar took the gardening (and florist) world by storm. Hardy in zones 4 to 9, this 3-foot stunner will perfume your entire garden in July. A grouping of fragrant Casablanca Oriental lilies is a magnificent addition to the white flower garden. The substantial, waxy petals stand out in cut flower arrangements and are especially popular in bridal arrangements. Some staking or a sheltered planting site will protect long stems from snapping. Avant-garde gardeners who crave something different will find it in the Martagon lily. The stems bear many layers of flowers in a pagoda-like shape. They are more shade tolerant than most lilies. Plant Martagon lilies in the fall and provide excellent drainage. The plants are slow to establish and may not bloom the first season. Small but mighty Tiny Bee dwarf Asiatic lilies glow along path edges and in patio containers. Tiny Bee is an excellent choice for windy areas where taller specimens tend to snap and break. Two-toned Asiatic lilies like the Lollipop variety look best planted in masses of five, seven, or more to draw attention to their spectacular coloration. If you provide these lilies with rich, well-drained soil and consistent moisture, you can expect your investment of a few bulbs to grow into many plants over the years. A long-lived and vigorous species lily, heirloom tiger lilies are perfect for those new to lily growing. Pendulous flowers bear many orange blooms with charming freckles in summer, and plants will spread and naturalize in damp locations. Sometime in March, you may notice containers of beautiful white lilies popping up everywhere, not just in the garden center. The so-called "Easter Lily," Lilium longiflorum, is a symbol of purity and rebirth for Christians, but it can grace your garden long after the Easter bunny has left the building. Easter lilies have a normal blooming time of late summer, so the plants you bought for your holiday celebration were forced into bloom. Plant them in a sunny spot in the garden that has good drainage. They are hardy to USDA growing zone 4 and may return for years with trumpet-shaped blooms on 4-foot plants. Lilium regale or the regal lily bears trumpet-shaped flowers similar to those you see on Easter lilies. However, unlike Easter lilies, the regal lily will grow 5 feet tall and needs support for its stems, which may bear two dozen 6-inch-long flowers each. A clear, bright pink lily, the Acapulco Oriental lily will not disappoint gardeners who seek exotic perfumes in their summer landscapes. Be on the lookout for the lily leaf beetle, which can be a problem in some areas. If you have a small number of plants you can stop this red pest with determined handpicking. Some lilies are better suited for the cutting garden than others. With the Elodie Asiatic lily, you get all the petals without the bothersome pollen that irritates noses and drifts onto tabletops. What do you get when you combine the fragrance of Oriental lilies with the huge flowers and reliable performance of trumpet lilies? You get a hybrid Orienpet lily. 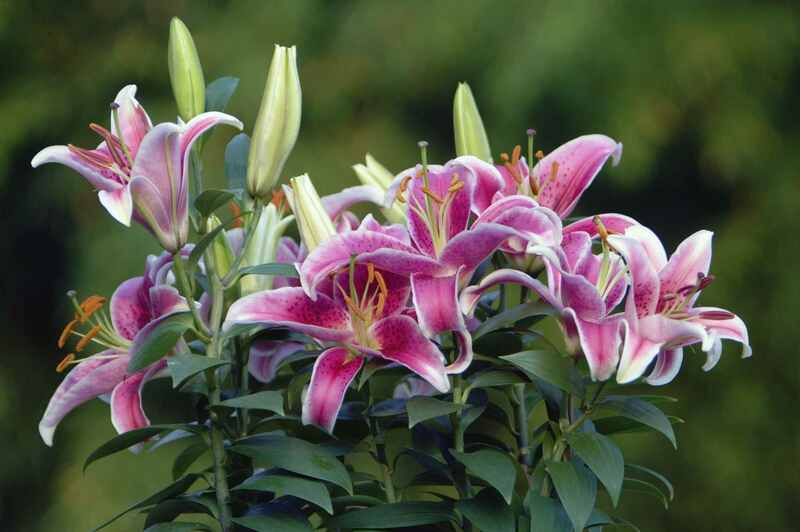 The Robert Swanson lily combines the best characteristics of Oriental and trumpet lilies. Plant in the fall where the lilies will get at least six hours of sun a day. The gold and bronze tones of the Luxor Asiatic lily will make a splash in your summer garden, especially when planted with orange companion plants like cosmos or butterfly weed. Hybrid lilies like Luxor do not come true from seed, so propagate them by taking offsets or scales by lifting the bulbs and peeling away baby bulblets. Lilies are not off limits to gardeners with small plots. A dwarf Asiatic lily like the Tiny Double You cultivar will tuck into a few square feet in a sunny patch. Dwarf lilies have fewer leaves to sacrifice for cutting, so admire these beauties where they grow so plants have the energy to form new blossoms next season. The intensely colored flowers of Asiatic lily Matrix are mesmerizing. With a high bud count of up to seven flowers per stem, you only need a few bulbs to create a focal point in the early summer landscape. The petite 20-inch stalks of Matrix lilies are just right for the container garden.